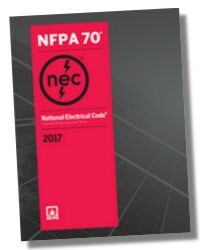 Completely updated to reflect the 2017 National Electrical Code®, the Fifth Edition of this user-friendly, practical guide features thorough, current coverage of grounding and bonding requirements in both Article 250 and Chapter 5 of the NEC®. 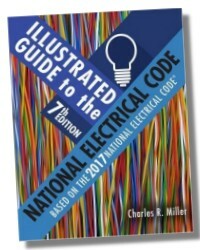 Full of clear explanations, real-world examples, and vibrant, full-color illustrations, this trusted text will help you master and apply key electrical concepts, such as calculating conductor sizes, reading and interpreting NEC tables, using grounded conductor connections in AC systems, managing installations and sizing, and applying "green" practices for energy efficiency and environmental sustainability. Whether you are pursuing a degree program, professional training, or an apprenticeship (e.g., Independent Electrical Contractors, electrical training ALLIANCE, former NJATC courses), you can count on this must-have resource to prepare you for career success. 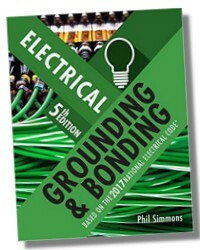 Drawing on his extensive experience as an electrician, educator, and consultant, the author provides engaging explanations, realistic examples, and step-by-step instructions to help readers understand, apply, and master the fundamentals of electrical grounding and bonding. Topics include calculating conductor sizes, reading and interpreting NEC® tables, using grounded conductor connections in DC and AC systems, and managing installations and sizing. In addition to current regulations and requirements, the text features information on important industry trends and practices, including methods and materials designed to promote energy efficiency and environmental sustainability. The Fifth Edition has been carefully revised to reflect the 2017 National Electrical Code®, enabling readers to reference accurate, up-to-date information related to relevant industry codes. 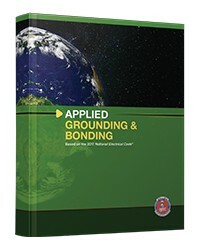 With extensive new and updated material, the text offers complete, current coverage of grounding and bonding requirements in both Article 250 and Chapter 5 of the 2017 NEC®. Appendix A: Some Fundamentals of Equipment-Grounding Circuit Design. Appendix D: Report of Research on Conduit Fitting Ground-Fault Current. 384 Pages - 8-1/2 x 11 in.